Today, I unsuccessfully searched for a smart consumer device that would link process and medical monitoring. I am sure it is out there, but I couldn’t find it. The opportunities are numerous. Imagine having a device that monitored your blood sugar levels and sent off messages based on your current levels. The messages could be to home to make something different for dinner. It could be a note to yourself to remember to snack earlier in the day. It could be a note to your physician keeping them aware of your situation. I think that the opportunities for consumer centric medical devices that have embedded intelligence and plug into some type of BPM or process centric model are great. This made me think of one of my favorite companies – IDEO. If you don’t know them, you should. They have been involved in all types of innovation and product design. 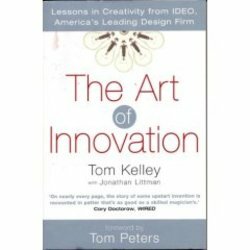 The Art of Innovation by Tom Kelley is a great book about their process. You should also read the article about the different types of innovators in Fast Company. This article categorizes them into Learning, Organizing, and Building personas. Which are you? I am either a Cross-Pollinator or a Collaborator (in my mind anyways).